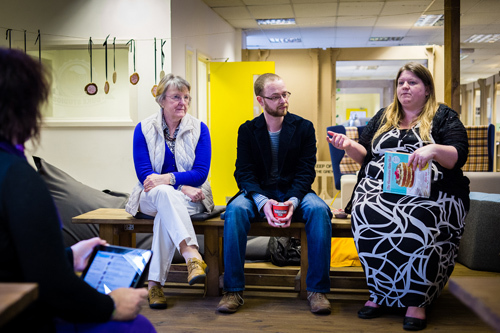 Last weekend, I was invited to go along to and speak at Blog North’s Food Glorious Food. A day which saw me hanging out with an army of creative and delicious food-related superheroes served with cuppa loads of tea and plate loads of food! It was a veritable cornucopia of an event to tease out your blogging tastebuds. 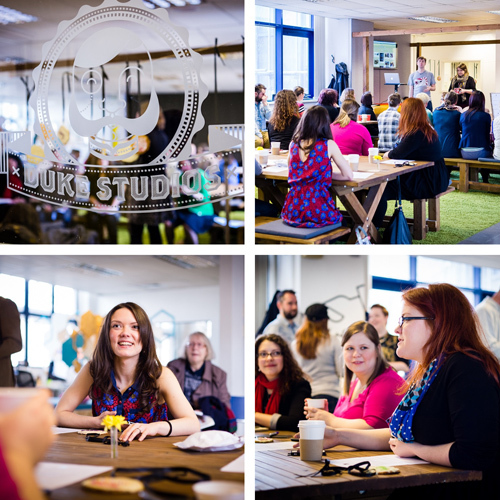 Held in one of the coolest creative hubs in Leeds, Duke Studios. The day saw plenty of food (quite expected) but more than that there were deliciously useful and engaging workshops to attend lead by an army of talented individuals who I was very pleased to have had the pleasure in meeting. Creative workshops ranged from food photography and tips with Paul Winch-Furness – and have you checked out Paul’s Instagram stream yet? you’re warned; it’ll make you very hungry! 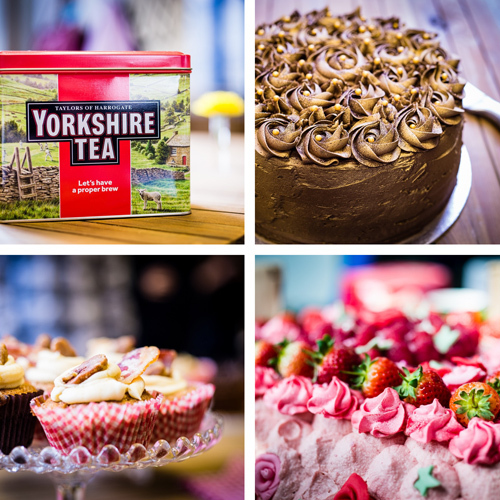 There were also creative food writing with Emma Sturgess and branding expertise with Sam Ward – Brand PR Manager from Taylors of Harrogate demonstrating the importance of why Clandestine Cake Club and Yorkshire Tea support each other to strengthen both group’s aims and messages. On arrival we were asked to take our giant ‘name badge cookie’ which were hung on a ‘washing line’ and asked to decorate it to however we pleased. One of my biggest passions in life includes creating new memories and experiences with others, my community! and I was also lucky enough to share both my personal story and the tale of Missie Cindz’s passion for food with aspiring food bloggers, creatives and entrepreneurs. A big thank you to those who supported and attended my sessions. 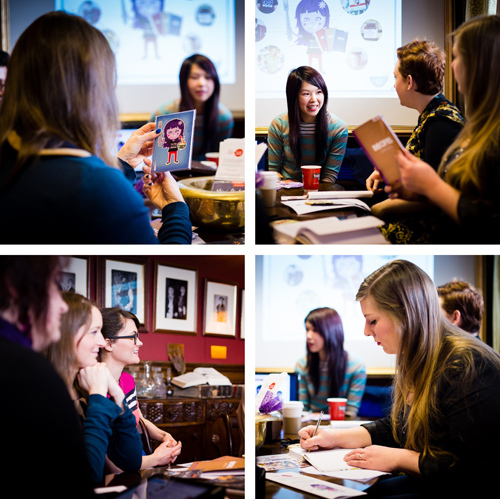 My workshop aimed to share with you ways in which you can express your love of food and grow online and offline communities with a creative use of social media, events and charming collaborations. I have linked a downloadable PDF of my workshop presentation so that those unable to attend my workshop can refer to it. I enjoyed Blog North so much that I’m currently thinking of doing more workshops and creative sessions in the future; to inspire and motivate you by blending first hand experiences with honesty and enthusiasm that will leave you feeling inspired and touched so that you can learn to improve your own personal and professional (food and life) endeavors! If you would like to express your interest in attending a Missie Cindz creative workshop/event please comment below so that I have a rough idea on whether I could fill a room :) ~ my worst nightmare would be having a party and finding out no-one turned up! On a final note, to those who came to my workshop you’ll know this ~ Remember to always keep yourself hungry to discover and learn! 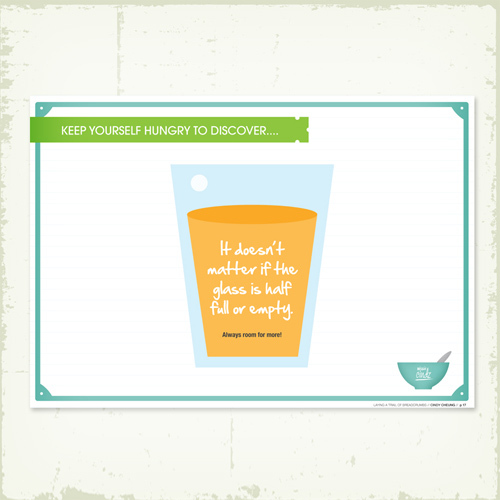 It doesn’t matter if the glass is half full or empty; there is always room for more! 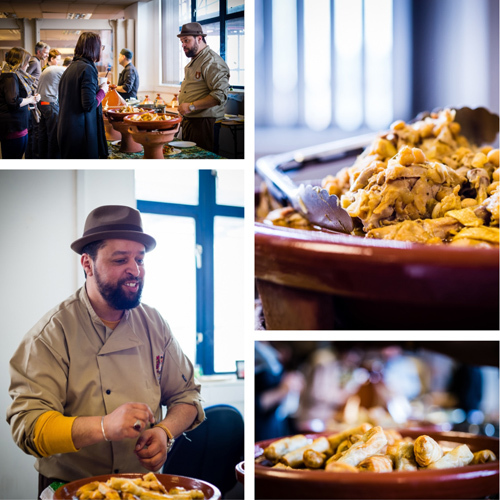 Lunch was served by award-winning Café Moor of Leeds serving us a huge gastronomic table of North African goodness. The owner and chef, Kada (pictured above) shared with us his own personal passions for food and telling the story behind his food operations in Leeds. If you’re ever in the city, do pop over to meet Kada and his team in Leeds Kirkgate Market, share some lunch, and hear about their plans to strengthen authentic food to life in Leeds city centre. I was also excited to hear about the launch of Delve, a new bi-annual magazine for Yorkshire produced by Emma Bearman and Fran Graham and many, many other talented contributors. It contains articles and stunning photography of some of the things that makes Yorkshire, so fantastically Yorkshire. I can see a lot of hard work has gone into this first publication ~ great work. Well done guys! On a Graphic Designer’s note, the design and print is absolutely fantastic too. The magazine, printed on high quality paper stock and contrasting materials, reflects an authentic, genuine, forthright tone of voice, capturing traditional food values and provenance. Every page captures a touch point of authentic, hand down quality that echos the magazine’s persona and how proud Delve are about Yorkshire’s food scene. I found myself feasting at the photography itself! The afternoon saw lots of cake cutting whilst we got to meet meet Lynn Hill and members of the Clandestine Cake Club and Leigh Linley of Good Stuff who both started blogging, developed great communities and events and are now published authors; sharing the secrets of blog-to-book success. So there you have it, blogging certainly is a passport to lots of amazing things! Thank you Blog North and Culture Vultures for introducing me to a plate of Leeds goodness! 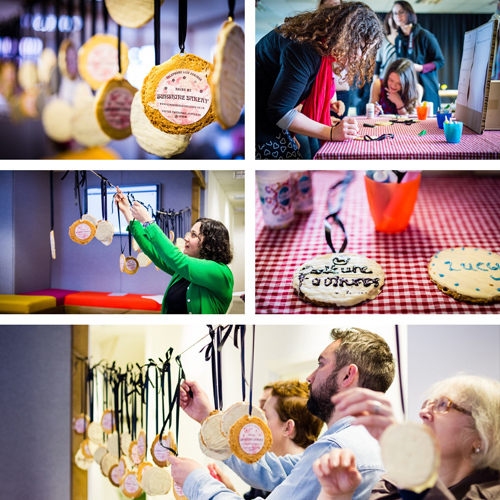 Blog North was a great event and thanks to everyone who was involved in making the day brilliantly engaging. I met so many wonderful people and left feeling inspired myself too!